The sculpture consists of a golden ladder set against a glass wall. 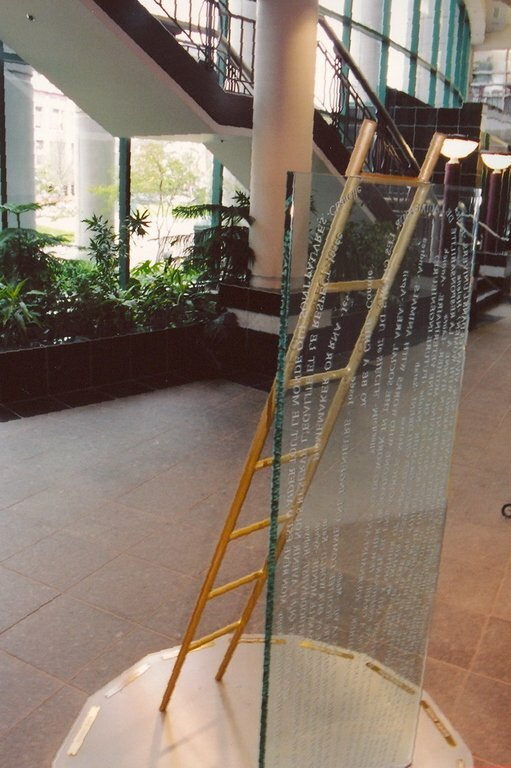 At the base of the ladder are the names of the fourteen women who died in the École Polytechnique tragedy. Carved on the glass are dreams and aspirations of girls and women. Genevieve Bergeron, 21. - Helene Colgan, 23. - Nathalie Croteau, 23. - Barbara Daigneault, 22. - Anne-Marie Edward, 21. - Maud Haviernick, 29. - Barbara Maria Klueznick, 31. - Maryse LeClair, 23. - Annie St-Arneault, 23. - Annie Turcotte, 21. - Anne-Marie Lemay, 27. - Michelle Richard, 21. - Maryse Laganière, 25. - Sonia Pelletier, 28. Phrases gathered from women expressing their dream and aspirations for the future. "To be appreciated as a woman and respected as an engineer" "I want to be an RCMP officer and a loving mother". Commemorative artwork on the massacre at the École Polytechnique in Montreal, where a killer executed 14 women.